More Checklists and a Video! Sailors love checklists! When we first talked about our Boat Check many of you asked for more details. Well – you asked, and we responded….finally! “Boat check” is something that the off-going watch does before they are relieved of their duties. It takes about 15-20 min to do a thorough job. Our watch schedule on our sail training expeditions is usually 6 hours on, 6 hours off, but we rotate a person every 3 hours. Therefore, Boat Check happens every 3 hours. Things can happen quickly on a boat, but many things happen slowly. It is those slow problems like chafe, wear, torque, silent drips, etc. that will lead to large problems. Checking everything every 3 hours will allow you to notice problems early, monitor their progress, and fix them before they become major issues. So – you can watch our boat check at this link. Please become a Patreon if you enjoy our videos. They take a lot of time and work to make and we would love to be able to do more for the community. This Boat Check is a working document – so please do add suggestions in the comments below. We would love to hear your ideas! Bilge level – look in engine room. Has the level changed? Engine room visual and olfactory check. Look for smoke, spills, splatters, loose objects and belts. Sniff for strange smells. Listen for strange knocks and hisses. Check shaft temp in engine room – note in log book. Check battery level – note in log book. Heads: look in at water level, look around for leaks. Make sure they are clean for the next watch. Ship shape – stowed for sea. Remember to check the galley and wash and show dishes! Radio and Systems – radio is on, no extra breakers on. For example, is the radar still on even after the fog cleared? Check to ensure the propane is off. Navigation lights are on or off depending on the time of day. Cabin lights are off (unless someone is using it). Dorade vents are stowed at first sign of rough weather. General appearance – do you notice any new drips, possible leaks? Do a “once around.” Check lashings, chafe, cotter pins, anchor lashing, fair leads, ship shape, all lines are coiled and stowed. In the cockpit coil and stow all lines. Make sure it is ship shape. Check propane tanks. Are the correct navigation lights on and working after sunset and before sunrise? Enter all the necessary data in the log including: position, course and speed, barometric pressure, battery level, sail plan changes, weather (wind direction, speed, cloud cover, precip, etc). Add any additional notes in the log. Please include fun stuff as well! What happened on watch – dolphins, cookies, seasickness, etc! Don’t forget to plot a position on the chart using correct notation for an electronic fix, celestial fix, DR, or triangulation. Review the logbook, weather, sail plan, watch details and anything else of consequence with the oncoming watch. To be done before running the engine. 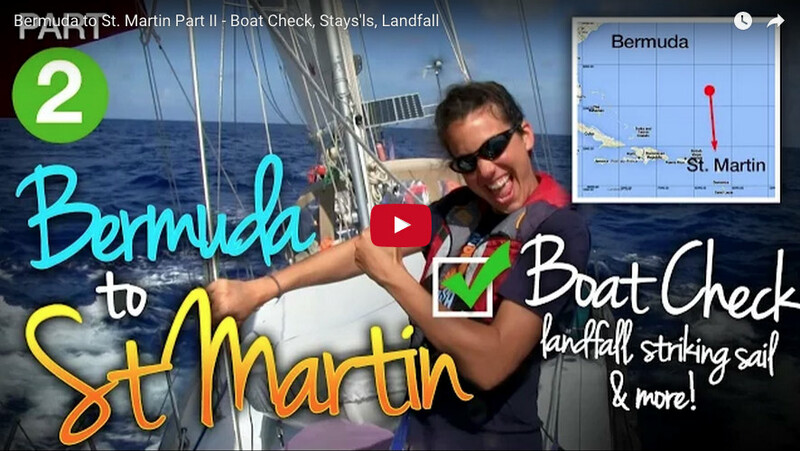 Watch our youtube video about boat checks! Morse Alpha © 2014-2019. All Rights Reserved.